Handmade Hen Ideas for Home! If you’re a hen with a creative streak and fancy showing your skills off at your hen party, then here are a few of our handmade hen party ideas at home that may tickle your fancy. Why not try out a more relaxed activity with a cute and crafty bunting making hen party. Work together and create some fabulous vintage style buntings. This particular activity is perfect for getting everybody involved and creating some decorations for your home or even on the big day. Cut and sew away whilst sipping on some bubbly with the girlies. The activity is mobile so we bring the whole experience to you – no stress! There will be a professional on hand to help and will provide you with all the fabrics and equipment you’ll need. With the activity lasting up to 3 hours, you and your hen group will have plenty of time to create some beautiful and unique decorations. Get involved in something a little bit cheeky and extremely fun with a mobile knicker making hen party. Pimp up your pants with some glamourous bits and bobs, have a giggle with the gals and pick up some tips and tricks off of your personal instructor, all in the comfort of your own home. This activity gives you the freedom to have some tasty treats, have a few glasses of the bubbly stuff and relax whilst making your nice knicks. All of the equipment and decorations include, some appliqué (layered fabrics), sequins, ribbons, lace, bows, and fancy Swarovski crystals. With such a wide variety to choose from, there is definitely something for everyone’s tastes. Another one of our cheeky handmade hen party ideas at home is the mobile garter making. This 3-hour session includes all of the ribbons, lace and trims you will need to create your saucy garters as well as expert advice from an experienced workshop leader. 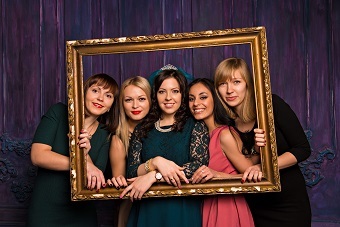 A great way to create something new for your wedding day and have a great time with the girls. Book your hen party activities with our events team hassle free today. Call us on 0161 341 0052, Happy Henning Ladies!